Sports Ink is a proud supporter of local businesses, schools, sports teams, charitable organizations and fundraisers! We would like to thank our community for shopping local and keeping jobs and businesses in Manistee! Take a look inside our shop below. Sports Ink was established in 2003 in my garage on Water Street in Manistee, Michigan. Over the next few years, the owner, Sharon, was able to hire a screen printer and add an Awards and Custom Gift Service with her daughter Lynn. As they grew the business, Lynn started Lucky Lizard Awards and Gifts in 2009. They both moved into the current building at 316 W. Parkdale Ave (US 31) in 2009. The Sports Ink staff has grown to six with the continued growth of the business. 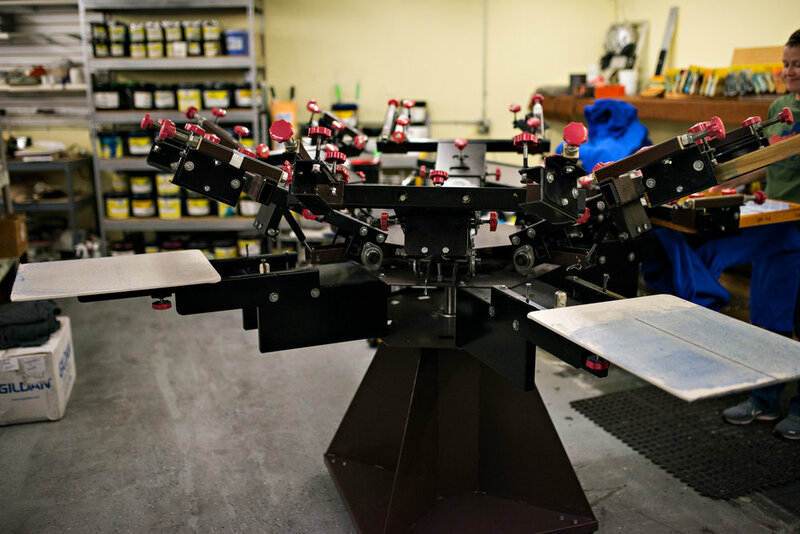 As the main source of custom screen printing and fan apparel in Manistee County, Sports Ink carries a large selection of jackets, sweatshirts, tees, hats and much more. There are no minimums, and there are quantity discounts. Stop in the store and check out the wide selection the next time you are in Manistee. Your satisfaction is our priority! As the main source of custom screen printing and fan apparel since 2003. Our newer high capacity machine. We take pride in our friendly service, quick turnaround, quality work and affordable prices. So just bring us your art or your ideas and together we will produce winning results. You can hit a homerun every time with our design and production team focused on your satisfaction. Give Sharon or Lynn a call, we would be very happy to help you! Mention you saw us on the web and receive 1 FREE setup! The original screen printing machine that we started on in the garage on Water Street. Our automated screen printing machine. Want to know about the latest sales? Submit your email to get on our mailing list.